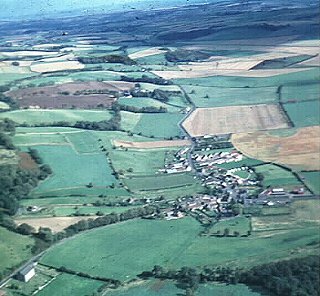 A village in the parish of Portmoak, Perth and Kinross, Scotlandwell lies to the east of Loch Leven and at the foot of the Bishop Hill, 3 miles (5 km) west of Leslie. A hospital established here on the site of an early Celtic foundation was gifted to the Red Friars in the 13th Century. Described in early charters as Fons Scotia, the hospital and village became a centre of pilgrimage, the Friars using spring water to cure an assortment of diseases. King Robert the Bruce, who came to be cured of leprosy, held a parliament here and in 1858 a canopy was built over the well that gives the village its name. Little remains of the Red Friars' Hospital except for a few foundations and a handful of gravestones. Buried here in an enclosure are the wife, mother and children of the Rev. Ebenezer Erskine, Father of the Secession Church, who was minister of Portmoak Parish between 1703 and 1730. There are a number of 18th- and 19th-century weavers houses and the remnants of a wash house, bleaching green and garden which, with the well, formed part of a mid-19th-century village amenity scheme designed by David Bryce for Thomas Bruce of Arnot. On the hillside above the village are the remnants of a mediaeval runrig field system known locally as the Crooked Rigs. A mile (1.5 km) to the south of Scotlandwell is the Portmoak Airfield of the Scottish Gliding Union.